Asus has added a new entry to its Designo series, the Designo Curve MX32VQ. The 32-inch 16:9 WQHD frameless monitor is designed for impact and built for a complete multi sensory experience for both work and play.The MX32VQ comes equipped with innovative design elements, quality audio technology and superb graphics, immersion and screen space redefining your viewing experience. Boasting 77% more pixels that conventional Full HD monitors, the company says that the Asus Designo Curve MX32VQ delivers a cinema-like experience where comfort meets style. Its unique frameless 1800R curved panel provides a wider field of view for a larger, more immersive viewing experience. The curvature of the screen ensures every point is equidistant to the users eyes, reducing ambient-light reflection. 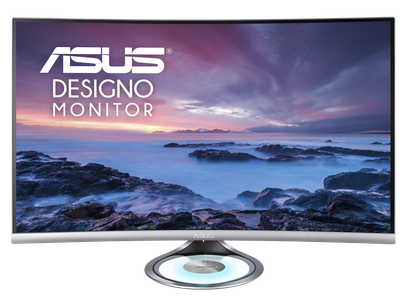 The monitor incorporates the Asus Eye Care technology with TÜV Rheinland-certified Flicker-Free and Ultra Low Blue Light technologies to help minimise eye strain and protect users from harmful blue light. The Asus Blue Light Filter has four different filter settings that can be accessed via the onscreen display menu, so users have full control over the amount of blue light reduction. Asus Flicker Free technology also helps reduce onscreen flicker for a more comfortable viewing experience. Designed with home entertainment in mind, the Designo Curve MX32VQ delivers theatre-quality audio with powerful 8W speakers and integrates Asus SonicMaster technology, co-developed with world-renowned Harman Kardon, a global leader in professional audio systems. The Asus Designo Curve MX32VQ was awarded the Good Design Award and the iF Product Design Award for its frameless, metallic design, featuring a one-of-a-kind Halo Lighting Base. The clear base allows for the customisation of lighting effects, as well as the synchronisation of lights and audio-output, all done with an intuitive volume and LED control to ensure a soothing and relaxing atmosphere. The Asus Designo Curve MX32VW is available now for $700 from PLE Computers, CPL Online, UMart and Scorptec Computers.